The most exciting Saddle Club adventure yet might also be the most difficult - and this time you won't have the rest of the Saddle Club to help you. A friend of the Regnerys's has invited Stevie, Lisa, and Carole for a holiday at Willowbrook Stables on Coventry Island. 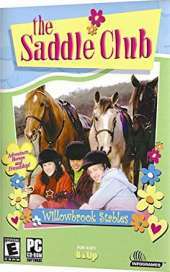 But only one girl and her horse can go, so you'll have to choose which member of the Saddle Club you want to be. And once on the island you'll have to solve a baffling mystery to save Willowbrook Stables from the evil property developer trying to take over. The island is a complex and colorful world of sights and sounds. It is home to over 30 characters, most of whom have lived there all their lives. Even though the other Saddle Club members won't be with you, you can still keep in touch and tell them all about Willowbrook Stables and your adventures. Other horse-crazy kids on the island will help you in your quest to save the stables. The skills that Lisa, Carole, and Stevie learned at Pine Hollow will come in handy in your investigations, as horses are just as important on Coventry Island as they are in Willow Creek. Ride all over in search of golden horseshoe clues and collect important information from interesting characters. You can get additional clues and track your progress in your personal game diary. If you solve all the clues, you'll uncover secrets that have remained hidden on Coventry Island for decades. You will have to be careful, though, as others are trying to solve the mystery, too - people who will stop at nothing to do so. If someone beats you, Willowbrook Stables will be lost forever.